Any bowler who can regularly send down six consecutive 150kph rockets is a man to respect. 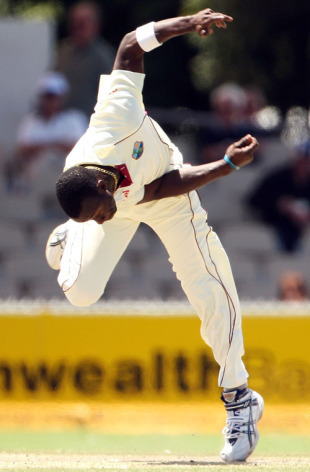 Kemar Roach did exactly that at the Adelaide Oval, where his speed was as impressive as Sulieman Benn's bounce. Although he finished up with slightly disappointing match figures of 3 for 159, Roach gave the Australians plenty to think about as they battled out a draw. Had he converted a couple of his tricky second-innings deliveries into wickets, Australia might not have escaped a defeat that ensured they will hold the Frank Worrell Trophy at the end of the series. As it stands, Australia head to Perth for the third Test with a 1-0 advantage but the captain Ricky Ponting said Roach would be a serious challenge on what is traditionally Australia's quickest surface. "He'll be a handful in Perth," Ponting said. "As you can see, every spell he's bowled, almost every ball he's bowled, is hovering around 150kph. We knew that he was capable of that. He's hit his areas really well. He hasn't sprayed the ball around too much. He's bowling well for them at the moment." Roach doesn't have the height of the great West Indies fast men of yesteryear like Curtly Ambrose and Joel Garner, but his skiddy action is still tough to face. Ponting had trouble against him in the first innings and was hurried up by a quick delivery that he tried to pull, but only managed to send a catch to Dwayne Bravo at midwicket. "Someone who is pretty short at that pace can get the ball to skid onto you pretty quickly off the wicket with not much bounce," Ponting said. "We've played him pretty well here [in Adelaide]. The ball reverse-swung for them in both innings. He's a handful, there's no doubt about that. He's someone who could play a fair bit of Test cricket for them in the future." The WACA might not be the fast-bowling paradise it once was, but Roach stands out as the most fearsome of the seamers in an attack otherwise made up of medium pacers like Bravo and Darren Sammy, and the medium-fast Ravi Rampaul. Roach is only 21 and is still learning his craft, but Ponting said the Australians would need to continue to show him plenty of respect. "Anyone that's bowling that sort of pace will trouble any batter, especially later in the game when the bounce gets a bit variable," Ponting said. "That's when you're at your most vulnerable against guys who bowl at that sort of pace."